Receding hairline is a male hair loss problem, especially for those with male pattern baldness. It is rare in women (including for those with female pattern baldness). First, it usually causes thinning hair on the temples. If it does link to pattern baldness, it can get worse which then eventually may cause partial or complete baldness. It’s common to see that receding hairline in men with male pattern baldness is usually not on the steady. But some treatments are available, and most men should be able to cope with. 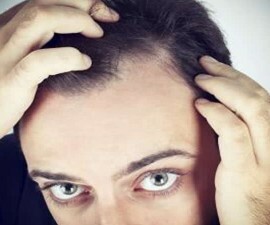 Male pattern baldness is common, and even it is the most common hair loss type in men. 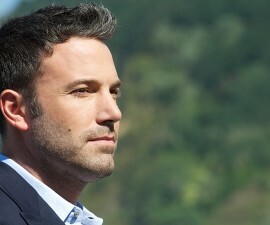 It develops gradually, and receding hairline is usually the early sign of the problem. In some cases, thinning of hair on the crown may start first. Hair loss can also occur together on the temples and crown at the same time. Over time, thinning hair on the two areas may eventually meet, causing U-shape. 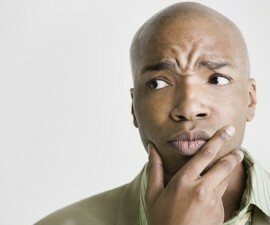 The word ‘baldness’ in male pattern baldness doesn’t mean that it will always end with baldness. Even if baldness does occur, this can also vary from mild to severe – from partial to complete baldness, as noted before. In fact, the rate of hair loss in men varies enormously. The problem can start as early as puberty in a few cases, or at the ages of 20’s. Others may not experience significant hair loss until at the age of 50’s. And there are a number of different factors and conditions that affect the rate of hair loss in men. But for male pattern baldness, it’s usually associated with genetic predisposition and the activity of androgen (male hormone, especially one called DHT ‘dihydrotestosterone’). In men, the production of male hormones increases after puberty (including for DHT). For those with genetic predisposition (a family history of hair loss, especially male pattern baldness), they have genetic tendency of having hair follicles that are more sensitive to DHT. Their hair follicles are easier to shrink due to excess DHT in the scalp. Furthermore, it’s thought that DHT can also shorten the life cycle of hair, especially for anagen (growing) phase. Normally, the growing phase can take years before it goes into transition phase called catagen (when hair growth starts to slow and shrink), and eventually telogen (resting phase) comes. Resting phase is when hair stops growing and then falls out (replaced by new hair growth and another anagen phase begins). DHT can cause shorter growing phase of hair follicle, from normally about 3-6 years to only a few months. And this is also followed with the progressively decline of new hair growth. Overall, DHT in most cases of male pattern baldness can cause thinner and weaker hair – and over time hair follicle will get smaller and may not be able to grow any hair. Some experts say that two years after hair follicle doesn’t grow any hair, it could be dormant and permanent hair loss occurs. Therefore, for men do concern about their pattern baldness, they should start the treatment immediately – unless if you choose hair transplant treatment. Hair transplant is different, because you don’t have to take it as young as you can! When you are still at young ages, it’s difficult to determine the stable donor site on your scalp. And choosing the right stable donor site for hair transplantation is the key on the overall success of the treatment. See also a comprehensive guide for receding hairline treatment options in this section! Actually, it isn’t exactly a disease or illness. And therefore the treatment is not always necessary since again it doesn’t pose the risk of certain medical condition. But in fact, most men find it can carry anxiety, stress, and may also affect their self-esteem. If you have this problem and it gets worse, and you do believe that treating it is worth a try, there are some treatment options to choose from. But first you may need a professional diagnosis. And one of first steps you need to figure out is how bald you are. It’s not easy to determine the general stages of how the problem progresses, because this can vary from man to man. But based on the Norwood Scale, the following are the most common types of how male pattern baldness with receding hairline will look like. Why Doesn’t Rogaine Work On Receding Hairline? Receding Hairline If Not Treated! ?